People of Dhaka are habitually like to take their repast in open space where they can take a deep long breath to smell the fresh air. But the city’s green spaces are gradually disappearing, thanks to infringement and illegitimate occupation by powerful quarters, which are exploiting them for commercial purposes. So, life in the capital can sometimes be claustrophobic as their options are getting closed day by day. But there has a place where people can visit averting the concrete jungle and can inhale the fresh air of the lake, which is seasoned with the fragrance spicy Kabab. The hot spicy seasoning of the kebabs creates a mouth watering aroma all over the place. If you say someone that you have visited Dhanmondi Lake but did not take any food form the eateries, nobody will believe you. It is pretty impossible to turn away their food items as the spicy fragrance of kabab, chicken fry, luchi, fuchk, chotpoty encourage you to take their test. Along with the serene environment of Dhanmondi Lake Park, Rabindra Shorobor will entertain all short of adda and stage shows after three in the afternoon. Under the gentle sun of the afternoon hours, the lush greenery and sprawling courtyards beside the lake becomes a place of rendezvous of all sorts. Hundreds of people including executives, senior citizens, and youths gathered there to engage in adda with kabab or something else. After a short adda or jogging people always gather here to have some coffee and a kebab to refresh them as the day will become incomplete without this treat. Asgor, one of the prominent kebab makers of Dhanmondi Lake area prepared all the 15 types of kebabs available in Bangladesh. Asgor is the direct disciple of Mustakim, the legend and guru of all the Kebab chefs of Bangladesh which help him to make his kabab tastier than others. The price is mostly affordable for the people of all classes. The price level is between TK 100-120. The stall owners made sitting arrangements for over 100 customers. The shops remain open from 3:00 pm to 11:00 pm. 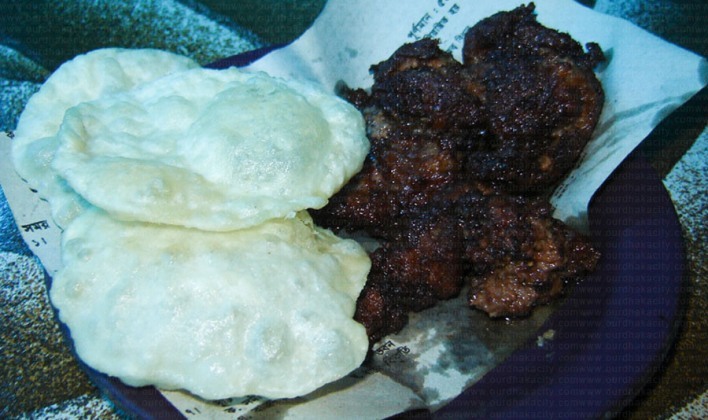 Fuchka and chotpoti of Rabindra Shorobor are popular all over the Dhaka. There are three fuchka and chotpoti shops adjacent to the amphitheatre of Rabindra Shorobor. Every shop has sitting arrangement for about 50 people. But in the evening, it will become hard to get a chair here as hundreds of people thronged there to take the test of fuchka and chotpoti. The specialty of these chotpoti and fuchka is their unique sour soup which made off with tamarind and some other ingredients. You will have to pay only 35-40 taka to get a plate of Fuchka or Chotpoti. The shops remain open from morning to midnight. There is one Pitha shop in Rabindra Shorobor which have collections of more than 15 types of pitha. Hence, the quality of these items is not standard but very delicious. You may fail to get any pitha after 9 pm. The price ranges will not more than 50. But you may get some items with 10 taka. If you are craving for tea, coffee or cold drinks, this place will never deprive you. They have all sorts of arrangement for you. If you like to take puri, singara and other items with tea, you can get it within some moments. But the price is little high compared to other places. They take 15 taka for singara and puri, 10-15 taka for tea and 20-25 taka for coffee. You have to pay 5-10 taka more beyond the MRP rate for cold drinks and other packaged items. They maintain the pay first theory. If you are diabetic patient or reluctant to take sugar then you are advised to not go for tea as their tea is made with heavy sugar.